Our practice is a membership model of care, with no hidden costs, fees, or co-pays. Our VIPs become second family, with 24/7 access to your family’s personal pediatrician who knows your child’s health like the back of their hand! Because of our extremely limited patient base, we truly know all of our VIP families. We are a family-owned private practice, focused on the most personalized, convenient, and accessible care, with an emphasis on the most modern medicine. Your family is our family. With Boca VIPediatrics, you have your “pediatrician in your pocket” 24/7. We know you’re always on the go, so e-mail and text communications are welcome. Often, pictures or video sent via these modalities can result in even more rapid diagnosis and an improved treatment plan. Nobody does newborn care like us! Babies are V.I.P.s, too! Why bring your newborn out and about when we can come to you? The first check-up (newborn exam) is performed in the comfort of your own home. No more driving to the pediatrician just days after delivery. For scheduled visits after the newborn exam, your family will have the office virtually to yourselves for no unnecessary exposure to germs. You’re a V.I.P.! That means you’ve got the “all-access pass” to reach your pediatrician by cell phone in the event of after-hours problems. When you’re concerned about your child, we are too. You can email, text, or call your pediatrician directly to their cell 24 hours a day, 7 days a week for questions or concerns. We schedule just one VIP at a time, so you’ll never find yourself having to wait in our waiting room, preventing exposure to unnecessary germs. Outside of the newborn exam, we make home visits for after-hours non-emergent issues that require prompt face-to-face attention. Learn more below! Our pediatric “smart office” is using the latest telemedicine devices to help your child get better, faster! Virtual visits with your pediatrician can help to evaluate and treat common pediatric ailments with the help of your smartphone. We are currently the only office in the Southeast United States using the Otohome iPhone device/app, which is a camera attachment for the iPhone that sends secure video of the inner ear directly your pediatrician for review when an ear infection is suspected. We are also the only private office utilizing the Clinicloud virtual stethoscope and bluetooth enabled thermometer. The digital stethoscope works with your smartphone to send secure heart/lung sounds directly to the doctor for review from anywhere you are. Our focus is getting children better, faster. Appointment length is whatever the V.I.P.s and physician deem appropriate, from 15 minutes to an hour or longer if necessary. There’s no time stamp on great care! We roll out the red carpet for our V.I.P.s! While you never plan on your child being sick, you can plan on having a backstage pass to same day or next day sick appointments and little to no wait time when you arrive. We only have space for a limited amount of V.I.P.s to ensure that all of these services can practically be applied. There’s no such thing as “our people will call your people!” All phone calls are returned by your pediatrician, both during office hours and after-hours. Calls are returned promptly, no more waiting all day for a returned phone call. You deserve the V.I.P. experience no matter which city you’re in! Jet set worry-free, because your pediatrician is only a phone call, email, or text message away from providing care. Our website is kept up to date with issues that are new in Pediatrics, including health maintenance strategies, treatment options, changes in immunization schedules, controversies, etc. For your convenience, evening or weekend appointments may be available. Our V.I.P.s always arrive in style! Give us a call when you are pulling up to our office and we will send a staff member to help with the stroller or car seat. In case of inclement weather, we will see to it that you are escorted in and out of the office under our umbrella. We got you covered! We know your kids have millions of health care forms for school, daycare, sports, camp, etc., and we’ll make sure they are back to you promptly. There is a strong focus on illness and accident prevention in the practice. This includes discussion of exercise and nutrition, as well as all aspects of physical fitness. Boca VIPediatrics can also arrange for you to visit with a pediatric nutritionist or personal trainer. Unless your child has a clear need for an emergency medicine physician (such as trauma), Dr. Rudnick or Dr. Gilbert make arrangements to see your child at the office or in certain instances, your home. In the event your child requires an emergency room evaluation, your pediatrician will help to coordinate care with the providing emergency room physician. Annual membership fees are structured based on age. Membership fees are all-inclusive with no co-payments. Discounts are provided for annual memberships paid in full. For more information on our fee structure, please contact us. Remember the bygone days of the doctor showing up at your home, black bag in hand? With our commitment to small town service and modern medicine, we’re bringing house calls back to offer the most personalized, convenient, and accessible care available. 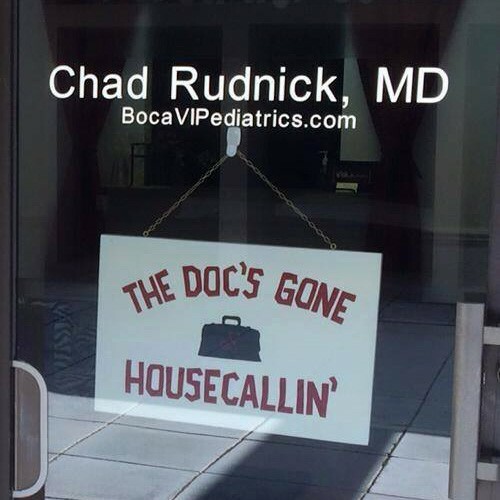 Aside from the first newborn exam after you leave the hospital, house calls are available to members of Boca VIPediatrics on an after-hours basis as deemed appropriate by the physician. Here from out of town? Treatment plan will be provided, and medication can be called in to a local pharmacy as needed. Save time, money, and receive the best and most convenient care possible when you’re away from home to get your children better, faster. Serving Palm Beach, Broward, and Miami-Dade counties. 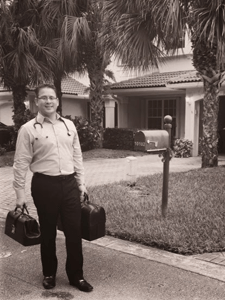 Please contact us to learn more about our Boca Raton pediatrician house calls or Palm Beach pediatrician house calls. *Payment is due at time services are rendered for non-members. We accept cash or major credit cards only. …when the Johns Hopkins trained dude in the office also wins the March Madness bracket challenge! There’s an unexplainable, priceless, breath-of-fresh-air feeling that comes over you as a parent when..